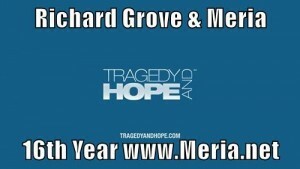 8/18/15 Tragedy and Hope with Meria and Richard Grove. Learning how to learn for yourself;more to history than we thought;fruits of liberty;8 second attention span;election “events”;”screw the future” Japan/nuke plant/volcano,Fukushima,Animas River;all world markets unstable;China markets & explosion;Microsoft 10;privacy;telegraphs were tapped and hacked, old news AT&T;spy vs.spy;Electoral college, who votes for them? arranged “debate”;Trump given center stage;Message of debates the same – consistent and wrong;same old hot button issues;do we need rulers? Hillary’s emails -surely the NSA has them;do you really have “nothing to hide and nothing to lose”? science fiction and the world of artificial intelligence and much more.